The author has very generously donated copies of his book for us to sell for the benefit of the project. The cost is £15 including postage for this 650 page book. This is the tale of Earl Morcar who was at the very centre of events leading the great battles of 1066 and the resistance movement that failed to prevent or reverse the Norman Conquest of Anglo-Saxon England. The book deserves a sub-title to introduce this important character to those interested in the events surrounding the iconic year of 1066 because most people will not recognise the name of Earl Morcar. Earl Morcar is a figure who has been lost to popular history although just enough has been written about him to allow a careful researcher to reconstruct a lifelike portrait of this complex and honourable young man. The author has done an excellent job putting the flesh onto the skeleton provided by the ancient chroniclers. The research is meticulous which makes the book a pleasure for any serious student of history. Where it has proved necessary to fill the gaps, the narrative is completely credible. Reading Unconquered with the eyes of a historian I found myself drawn into the story and had to remind myself from time to time where speculation took over from the known facts. This is a mark of how carefully the author has stuck to the facts. It almost felt as if I was reading the source journal for the chroniclers that have survived rather than vice versa. The book is presented as a detailed narrative, written in the first person by the earl himself. This makes it a very intimate account provided by the only person who we know of who was a witness to all of the politics and much of the action of 1066. Apart from the last two battles of 1066 at Stamford Bridge and Hasting, Morcar was present at most of the other assemblies where the fate of England for the next few centuries was decided. The narrative captures the way the Anglo-Saxon world was ruled just before the Conquest. It provides what we understand to be an accurate portrait of the complex web of kinship and obligation which determined people loyalties and directed their actions. The book takes up the story of the house of Mercia where the old earl Leofric was the last survivor from the time of king Cnut. Morcar’s granny, lady Godiva, provides some love and stability for the young boy whose own father is often exiled and whose mother is suffering from mental illness, Morcar is growing up in a world where the house of Wessex, with an ambitious earl Harold at its head, is stealthily imposing the government of the south on the whole of England. The role of Harold's younger brother, earl Tostig, is particularly well developed. A young earl Morcar finds himself selected to head the coup to oust Tostig and bring England to the brink of civil war. Given that the teenage earl Morcar was invited to be the earl of Northumbria, where blood feuds had reduced the stock of noble blood, and the coup was replacing the hunting companion of king Edward who was also the brother of earl Harold of Wessex, one has to marvel that Morcar survived. The book sets out an understandable basis for the strong alliance that was forged in England at the start of 1066 to keep to secure against the expected invasions. 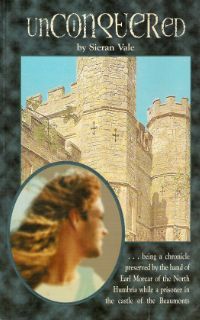 The chronicling of the tortuous events which Morcar observed as a boy with the marriage of his sister to Llewellyn, the king of Wales, are wonderfully constructed to make the re-marriage of his widowed sister to king Harold credible. We know it was Harold who sponsored the efforts to hunt down and kill Llewellyn making it difficult for those confined to the history books to understand how he could take the widow as his bride. Earl Morcar becomes the brother-in-law to the new king and before the year is out guardian to a claimant to the throne captured by William from Normandy. After the defeat of king Harold at Hastings, Morcar becomes the leader of the English resistance while his elder brother, who is several times incapacitated by wounds, takes refuge from the physical and mental pains in ale and mead. The uneasy relationship between the two surviving earls of England and William is well caught and the contrast between the feudal ways of Europe and the more subtle structures of obligations of power in England makes sense. William only truly trusted those who were his prisoners. The complex events in the early months of 1066 are told as a detailed and very human story. It enables the reader to understand how the new king Harold was able to unite the country by explaining the way that the bonds of loyalty and kinship dictated the manner that unity was maintained. The book employs much old English-usage and old names. It might have helped to include a glossary of place names for those who do not know that Eorfrwic is York. A map might also have proved useful along with a table of the known genealogy. It would be worth digging out one of these from a history book to appreciate the importance that kinship played in the events of the time. Unconquered is a big book with over 600 pages. It is written almost as a journal of the life of earl Morcar so there are passages where the storyline is slow. This is the story written as history which imposes a strict discipline on the writer who cannot invent event, people and places to support the story and generate tensions to suit the narrative. This does not detract from the book which is packed with the details of daily life, loves and ritual. The books capture the turbulent political struggle along the north/south divide that is still detectable in modern times within England. Unconquered details how England was able to meet the various threats it faced in 1066 as a united nation and how powerful the resistance that continued for many years. This is an informative read.